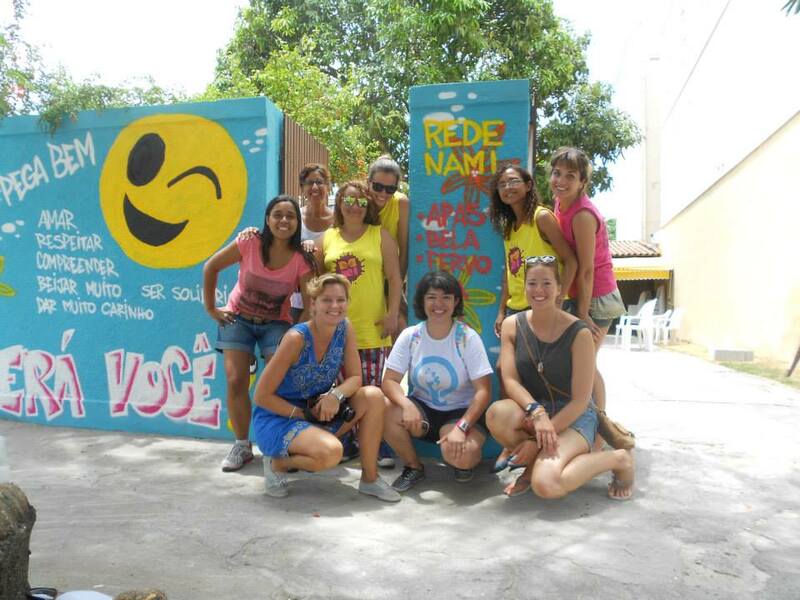 Rede Nami-“a Feminist Network using the Urban Arts to promote women’s rights”. 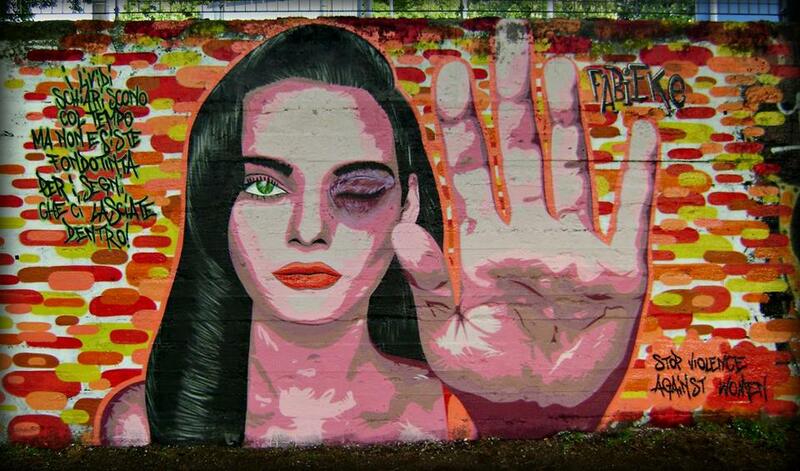 Domestic violence against women was only made illegal in Brazil in 2006. Recent statistics show that every 15 seconds a woman is assaulted; every two hours a woman is murdered. 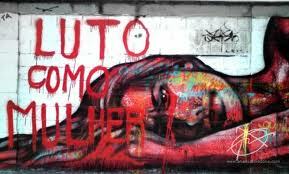 Brazil has the seventh highest rate of violence against women in the world and according to estimates published by the Brazilian Institute for Applied Research, between 2001 and 2011, fifty-thousand women were murdered in Brazil, mainly as a result of domestic violence. 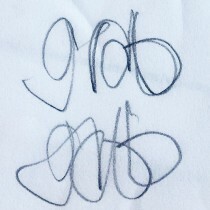 gab connected with a Panmela Casto, an art activist in Rio to delve into her world that demands equal respect and rights for women, challenging oppression of gender in personal, economic, political and social spheres. Pamela’s personal work has autobiographical undertones, using the urban landscape as her back drop, to explore social issues/truths in ideas surrounding the construction of being a women. Her visual language creates pieces in relation to the female body, power relations and sexuality using hot colours in dramatic dialogues on the public walls of Rio. 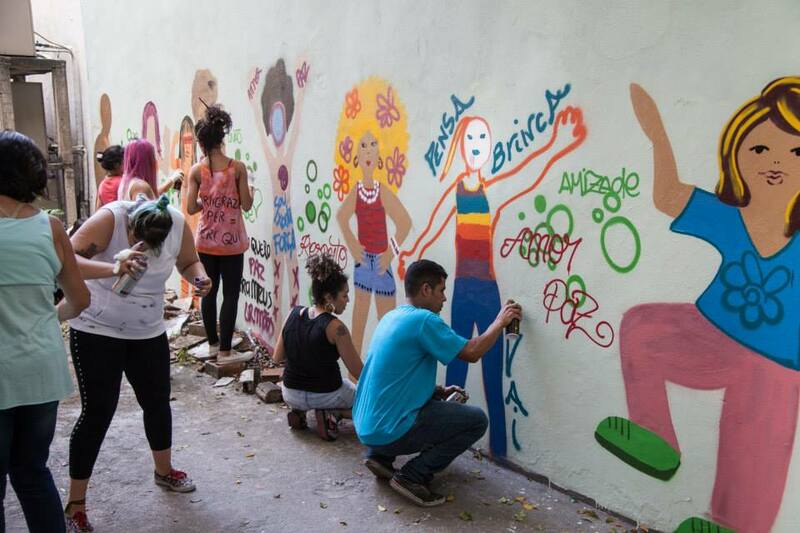 Having taught for over 14 years; giving workshops and lectures on graffiti and gender equality she founded the NGO Rede Nami which seeks to address, educate and raise awareness surrounding domestic violence towards women. Her art work and approach of innovative methodology has been recognised receiving two awards in the category of human rights. Using art as a communication tool, the NAMI Network ‘s mission is to contribute to gender equality; confronting prejudice, racial and ethnic discrimination, class, religious, and sexual orientation. They recognise the need for redistribution of societies resources and wealth in the pursuit of overcoming social inequality, which significantly affects women. 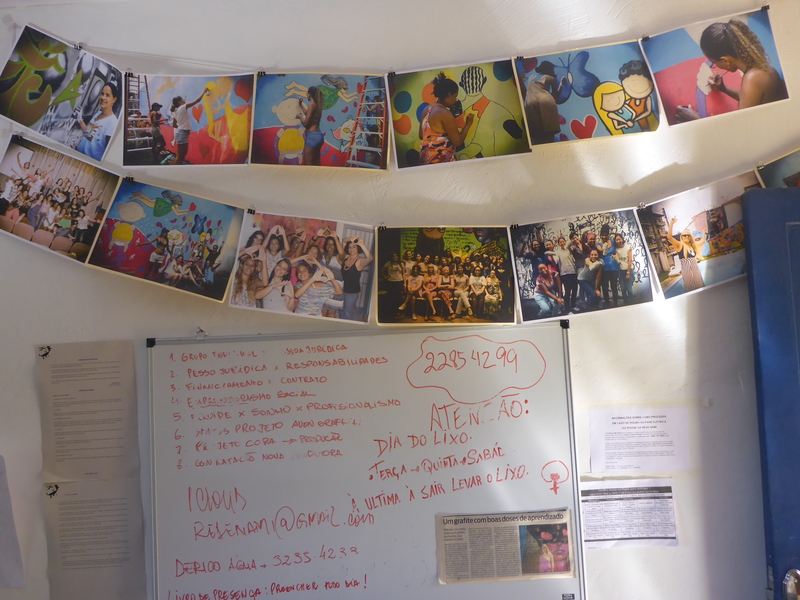 They run a large selection of programmes from graffiti workshops with young women in favelas, educating them about their rights to large paint ups of refuge centres for women, transforming sometimes oppressive buildings into places of colour, vitality and celebration. We travelled to places around and outside of Rio working along side them. We took part in paint ups and aided them in their fundraising schemes. 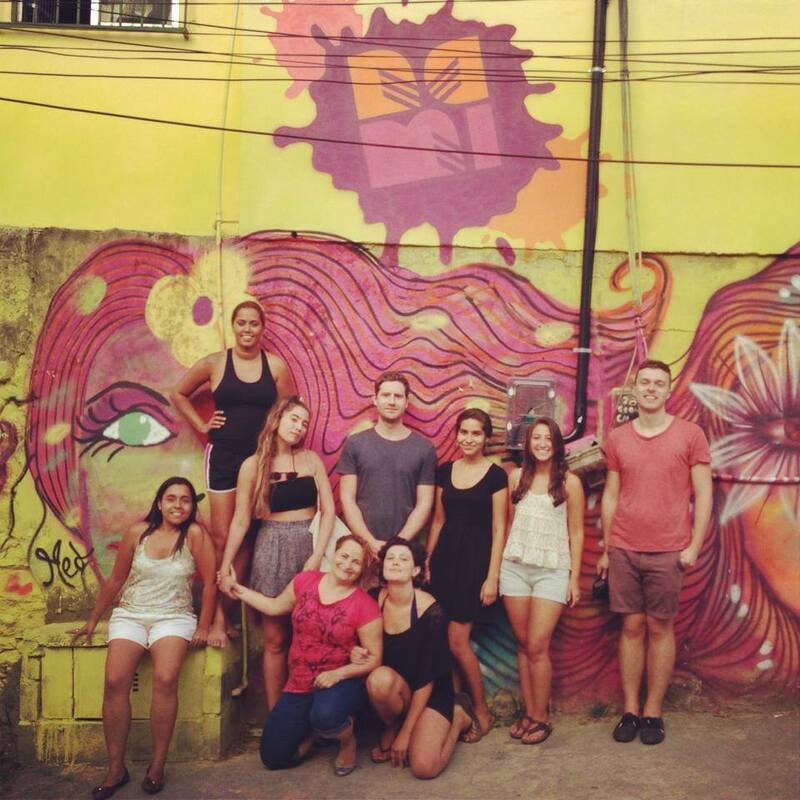 This was a particularly interesting group to connect with being women ourselves and experiencing the macho dominated culture that is rife in Rio. We found Brazil to be a land of great paradoxes. It has a female President, carnival (which has women parading round in exposing outfits), the dental floss thong bikinis, and a sexually relaxed culture . . . yet there are some very hypocritical suppressive attitudes towards women which we struggled with daily and that are reinforced and impacted by patriarchal traditions rendering the society full of inequalities with gender, holding women subordinate to men in familial and community relationships. However through these projects such as Redi Nami women’s role in society is changing. The debate over women’s position is improving and being heard, representing the diversity of women you find across the Brazilian population, who are totally independent, real fighters and demanding change.